Now you can Download MIUI 10 China Beta ROM for all supported Xiaomi Devices. The MIUI 10 ROM is currently available only for Mi 5, Mi 6, and Mi Mix 2S, and Redmi Note 5. Other Xiaomi/Redmi device will receive the update soon. The new MIUI 10 features a UI redesign, new recents, and AI Portrait. MIUI 10 China Developer ROM for all supported Devices is now available and the user can taste of MIUI 10 before it is officially released. Follow the below guide to Download MIUI 10 Update for all Xiaomi Devices and update it manually. MIUI 10 Global ROM will be available soon but for now, you can Download MIUI 10 China Beta ROM for all supported Xiaomi Devices. MIUI 10 update has been released in China only at the moment. But because it has English as an option too and you can install it from settings. Download MIUI 10 Update for all Xiaomi Devices from below. Check out Complete List of MIUI Features, Compatible devices, and Release Date. Many users reported that most of the features are working on their device and you can use MIUI 10 ROM as a daily driver. The MIUI 10 ROM is the Chinese ROM and includes Chinese bloatware also Google applications in this build are not included, but you can later Install it manually. 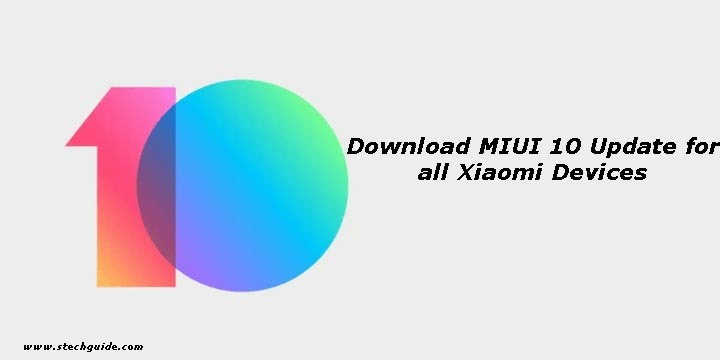 Download MIUI 10 Update for all Xiaomi Devices from below. To install MIUI 10 update for Xiaomi phone download either Recovery ROM or Fastboot ROM from above and use the below method to install this on your device. Download MIUI 10 Update for all Xiaomi Devices and flash it. Comment below if you have any doubts. Stay connected with us via Facebook, Twitter, and Google Plus to read more such helpful posts.